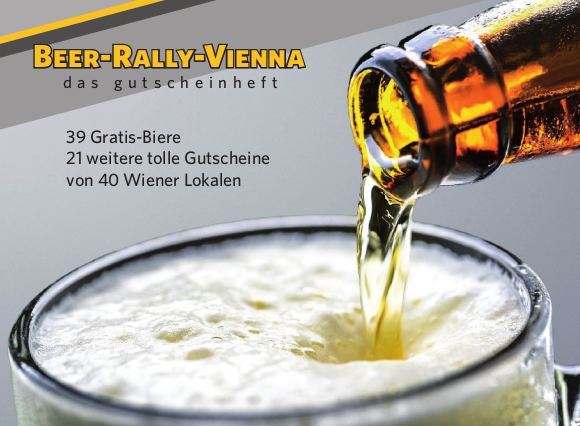 Beer-Rally-Vienna is a coupon booklet that includes free beers (2 for 1) and other perks and discounts of up to -30% on the total bill in over 40 Viennese restaurants. A pleasure trip through Viennese restaurants. The low retail price of EUR 19.90 and that everyonE finds the right coupons for themselves. Moreover, with most other coupon booklets, it is true that two get, e.g. dinner for the price of one, but the one is still very expensive. That falls away with us. And we specialize mainly in drinks, which did not exist in this form. How did you come up with the idea with this voucher booklet? Originally by my cousin, who distributes a golf book similar to golfers: one pays, two play. However, of course, the majority of the Viennese population goes after work or on weekends with friends, family or colleagues for lunch, dinner or in bars rather than meeting for a round of golf. While browsing the already existing offers, I found a gap in the market especially in the field of drinks, which we have hereby closed. For 70 percent of Austrians, beer is part of the culture of our country and the way of life. On average everyone enjoys around 106 liters or 212 Krügerl a year. Our beer tradition in Vienna looks back on a long history, which is now being supplemented by the Beer Rally Vienna. With the Beer-Rally-Vienna voucher booklet you can take an exciting journey through 40 diverse Viennese restaurants, each enjoying a Krügerl for free and use it at more than half of partners alternatively also on food and other drinks. Why did you choose Vienna? The question did not arise. I live in Vienna, I love Vienna and the local density is also excellent. If you love beer you know - it always tastes good! But in the right ambience - preferably with family or friends - even better. Beer is one of the oldest alcoholic beverages and part of our culture, but so far there are hardly any deals around beer, which span a range from beer enjoyment to the diverse experience in Vienna's gastronomy. The Beer-Rally-Vienna has therefore started in 2018 to close this gap. We started 2018. January to August 2018, we searched intensively for the partner premises, in August the company was founded and in September we started with the online sale. Because I'm a Viennese through and through, Vienna has so much to offer, the Viennese are incredibly nice and helpful people although some hide behind a grumpy facade and of course, because the Viennese beer is simply amazing. What makes this city so special? That you never get bored thanks to the varied offer of culture, restaurants, sports and leisure. The Arena, the Danube island and of course our partner restaurants.